Նախադիտման չափ՝ 800 × 585 պիքսել։ Այլ թույլտվությաններ: 320 × 234 պիքսել | 640 × 468 պիքսել | 1024 × 749 պիքսել | 1280 × 937 պիքսել | 30 000 × 21 952 պիքսել. Կորդինատները 48° 12′ 13,32″ Հս. լ., 16° 21′ 42,48″ Աե. ե.
Աղբյուր Levels adjusted from File:Pieter_Bruegel_the_Elder_-_The_Tower_of_Babel_(Vienna)_-_Google_Art_Project.jpg, originally from Google Art Project. 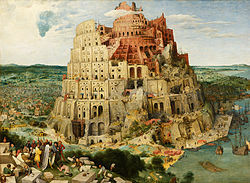 This is a featured picture on the իսպաներեն language Wikipedia (Recursos destacados) and is considered one of the finest images.